The Bellator 208 weigh-in results are in and all main card fighters made weight. Tomorrow night (Oct. 13), Bellator 208 will take place inside the Nassau Coliseum in Uniondale, NY. In the main event, Fedor Emelianenko and Chael Sonnen will do battle in a semifinal bout in the Bellator Heavyweight Grand Prix. The winner will meet either Ryan Bader or Matt Mitrione on Jan. 26. Emelianenko tipped the scales at 236 pounds, while Sonnen hit the 227-pound mark. In the co-main event, former Ultimate Fighting Championship (UFC) lightweight title holder Benson Henderson will meet Saad Awad. Henderson made weight at 155.8 pounds and Awad clocked in at the same weight. Cheick Kongo will also compete on tomorrow night’s card and he’ll meet Timothy Johnson. Kongo tipped the scales at 239.2 pounds, while Johnson hit the 265.6-pound mark. 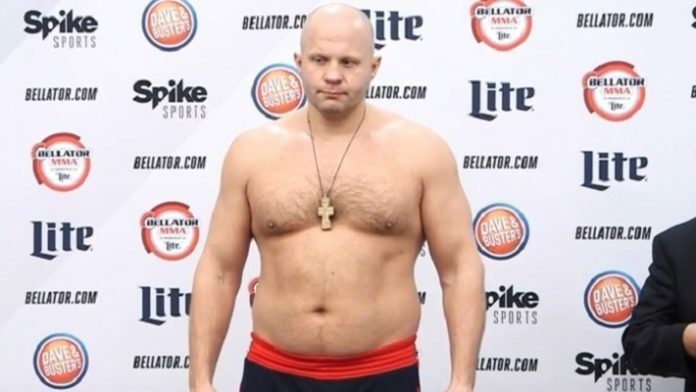 That’s not all as former Bellator middleweight champion Alexander Shlemenko weighed in at 185.2 pounds, while his opponent Anatoly Tokov made weight at 185.8 pounds. The main card will open up with a featherweight bout between Henry Corrales and Andy Main. Corrales reached the 146-pound limit, while Main clocked in at 145.6 pounds.